Hotel rooms, airport terminals, and coffee shops never seem to have enough power outlets to handle all your devices at once. With the HITRENDS Mini Surge Protector you no longer have to choose what to charge first. 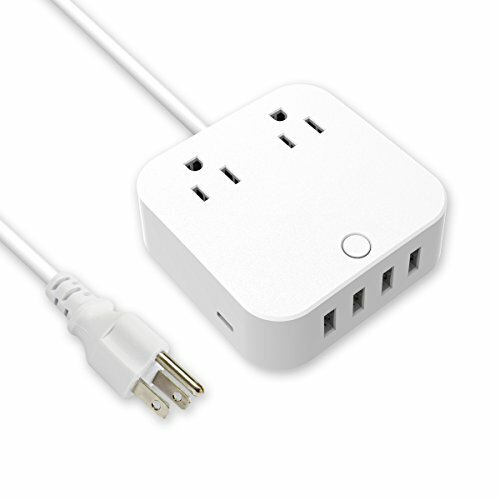 This surge protector features 4 Super Charging USB ports with a max output of 10A, so you can easily charge your cellphone along with other USB devices. Its integrated intelligence charging technology enables the charger to deliver the fastest possible charge speed up to 2.4 amps per port. Type C Ports is the latest standard of USB interface, and represents the fastest charging speed in current charging area. 1 USB-C port for Nokia N1 Pad, Lumia 950, Google's Tablets, Nexus 6P, Gigaset ME pro, etc. Note: The Type-C port doesn't support Macbook, Macbook Air, Macbook Pro or any other laptops which needs 14~22V charging voltage. If you have any questions about this product by HITRENDS, contact us by completing and submitting the form below. If you are looking for a specif part number, please include it with your message.